Wendy A. Mills was born in Sydney in 1950 and lived in Brisbane from 1975-2013. She studied at the National Art School in Sydney in the late 1960’s and then at the Queensland College of Art from 1977-79. Her work in the 1980’s was large temporary installations then in the 1990’s it changed to onscreen digital artworks and installations with projections. Since the late 1990’s she has mainly produced commissioned public artworks. Although Mills develops artworks alone most of her pieces have been produced in collaboration with others: practitioners in the arts, built environment designers, various technicians and friends. In the early stage of her practice she was partly involved with the Brisbane ARI’s and exhibited in Produce Art with the artist collective at Red Comb House. She then established two artist studio/gallery spaces one at the John Mills Building 40 Charlotte St Brisbane in 1982 and in 1990 the Wharf Shed Studio at Macquarie Street Tenerife. Mills spent a year at John Mills producing artworks and holding impromptu events of installations with projections and electronic music produced by Graham McConkey. The two other spaces on the ground floor were occupied by artist Wendy R. Mills and, for a short time, photographer/writer Bruce Muirhead. Wendy A. Mills’ studio was passed on to installation artist Lyndall Milani early 1983 and later to artists Judith Wright and June Tuppicoff. Wendy R. Mills’ space later became John Mills National run by Virginia Barratt and Adam Boyd. Mills visited other artist run spaces but continued to work alone and seek out studio spaces when needed. These ranged from the Queensland College of Art campus at Morningside, to Lyndall Milani’s studio in Spring Hill to the old Peter’s Slip, a ship repair workshop at Kangaroo Point. The latter was divided into three spaces with glass artist Mitch Foley making explosive glass works and a performing arts group (?) both on the floor above Mills’ studio. The second artist space Mills undertook was an old two-story corrugated iron wool store between Macquarie Street and the river’s edge at Teneriffe. The wool store was part of a building complex where various artists rented studio space. She shared her 100 x 20 metre space with violinist and architect Maurice Shaw. Mills left Australia in 1992 and handed the space to artists Maree Bracker, Midge Allom and Barbara Penrose. During the 1990’s Mills worked increasingly with video, photography and computers producing installations with projections then mainly onscreen artworks. 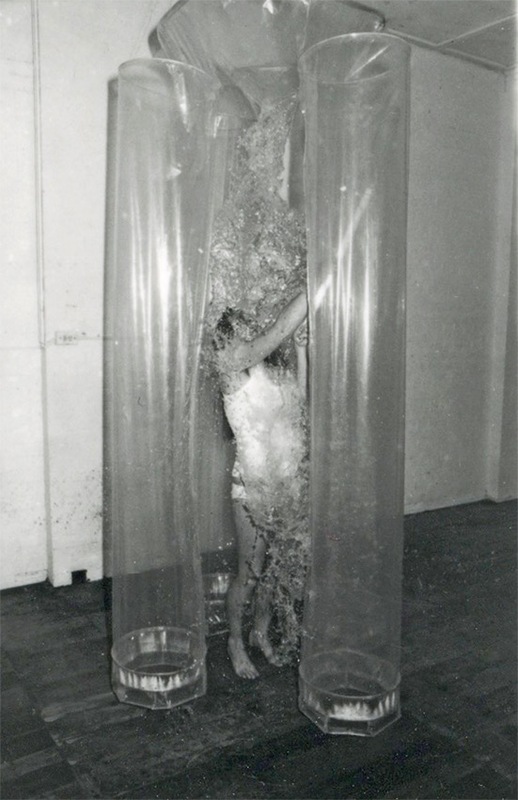 Her A Fish Half Out of Water Splashes was shown in Nature of Space at IMA 1993. She collaborated with dancers Zen Zen Zo and composers Stephen Leek and Carla Thackrah on other digital works. The 1970’s were the height of the alternative lifestyle movement and I came to Brisbane for meditation retreats in the surrounding areas. I was a Sydney art school dropout, had travelled extensively and found Brisbane quaint with its wooden houses and footpaths strewn with perfumed frangipanis and rotting mangoes. The city was small enough for a community spirit to exist but the government seemed to be focused on destroying its heritage and profiteering from corruption. While waiting to move to a farm where I could grow my own vegies I enrolled in the Queensland College of Art. It was a relatively new campus with a range of international lecturers who knew the craft of producing art and had the vision to expose students to the current trends of performance and installation through a visiting artist program. The resulting interest in performance, installation and land art that arose amongst some of the students didn’t have a future in the commercial gallery scene but did contribute to the development of artist run spaces. The IMA’s program was also a stimulus for young artists and an outlet for ideas and practices outside the frame. During the 1980’s I was exhibiting in national sculpture exhibitions and was aware of the difference between the Brisbane artists’ supportive community and the more competitive attitudes of the southern artists. Sculpture students from Melbourne at the Sculpture Triennials in Mildura were surprised at how supportive Brisbane artists were of each other and also lamented that they had to weld steel modernists type sculptures to pass. Ephemeral and installation work wasn’t accepted. The Bjelke-Petersen Regime, “The Police State” years; Qld’s unique 1980’s political backdrop, twenty years of “oppression” how did it directly or indirectly impact upon you, your friends and peers Wendy, or not? It was a constant topic of discussion, outrage and protest. Friends were barred from enrolling in law at Queensland University because of their participation in political protests and subsequent arrests. Also, people who appeared unusual were harassed by the police. Some chose to move to Sydney. During part of the 1980’s I lived in a share house with poets, writers, musicians, refugees, environmental and political activists. We had a loose connection with the West End Catholic Anarchists and were under surveillance by Queensland Police Special Branch. We suspected our phone was tapped and we knew for certain they came to our door mainly disguised as collectors for the Red Cross and trying to gather information about our associates and us. There was a slight feel of revolution in the air but life was easy in Australia. The work produced in some of the artist collectives echoed a kickback response to the repressive conservative government. And the type of design or art work you were making during the 1980’s Wendy, the media/technology used, key subjects, contents and themes? As a student I was making installations and structures to suspend my body. 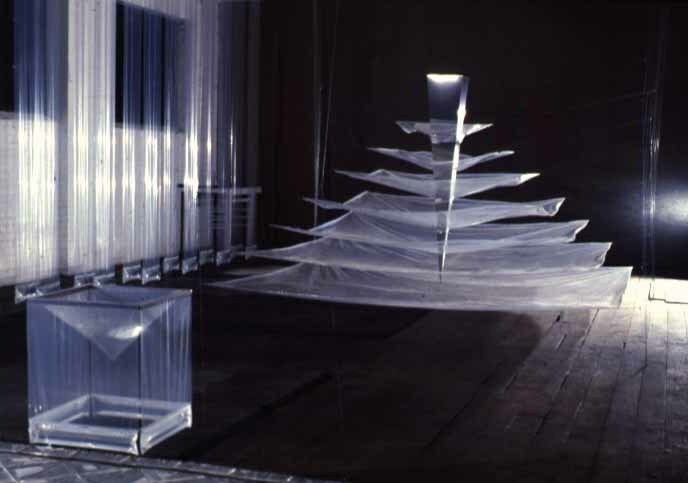 After graduating I began working with clear polythene sheet, water, light and steel producing temporary installations. The works were in the tradition of religious architecture that used geometry to alter states of consciousness. The transient nature of the work and the transparent materials were an attempt to speak of my interest in multiple realities. Tell me a wee bit about a vivid and memorable artist or artist-run space/project/exhibition/performance collaborations you directly participated in? Although I attended many artist cooperative events I generally produced work by myself. In 1990 I staged Memorial a 40-minute performance/installation at my studio the Wharf Shed at Teneriffe then re-staged it as an IMA Annex exhibition. The Gulf war was on at the time and the work was concerned with the role of women in Islam. It was produced with the assistance of Bhakto Doty and Maurice Shaw. Steven Leek and his VoiceArt group were embedded in the blackened installation and responded with astounding voice and feet sounds to the theme and visuals in the work. Kinship: A brief biography about you and your family Wendy? My family has been in Australia for a few generations – background mainly British and French with rumors that a great-grandfather deserted the French navy in Tahiti. My parents were from Redfern, NSW. So much collaborating happened in 1980’s artist-runs, tell me about two or three most vivid and fond memories you have about the artist-runs, artists & events? Jeanelle Hearst in performance with a carton of eggs in one hand, or were they in a shopping trolley, and throwing them one at a time at Russell Lake. He would duck and they would hit the wall or floor. Barbara Campbell in performance as wife cutting up a pumpkin, cooking it then offering plate stacked with pumpkin to Ted Riggs for dinner. A young woman, maybe an ex QCA student and with connections in Perth suspended herself in a net above a stairway at the back of inner city buildings, cut her toe and let the blood drip onto a target on the stairs landing. She was part of a mixed exhibition at night. Who was she? What exhibition was it? John Nixon’s installation of a small stick placed across the upper corner of a room and resting on the picture rails. The work of Adam Wolter and Gary Warner. Also Hollie. Brisbane was smaller than Sydney and Melbourne and the art community smaller so the artists were less competitive and more supportive of each other. There was also a huge difference in real estate values between Brisbane and Sydney and inner city vacant and near derelict buildings were being held unused while owners waited for prices to increase. The City Council owned some of these buildings and rented them at low rates, as it was preferable to have to artist/caretakers than to leave the buildings vacant. This situation made for cheap rents for artists and particularly groups of artists. Thanks so much Wendy, and anything you would like to add about this archival gleaning and research here at remix.org.au? 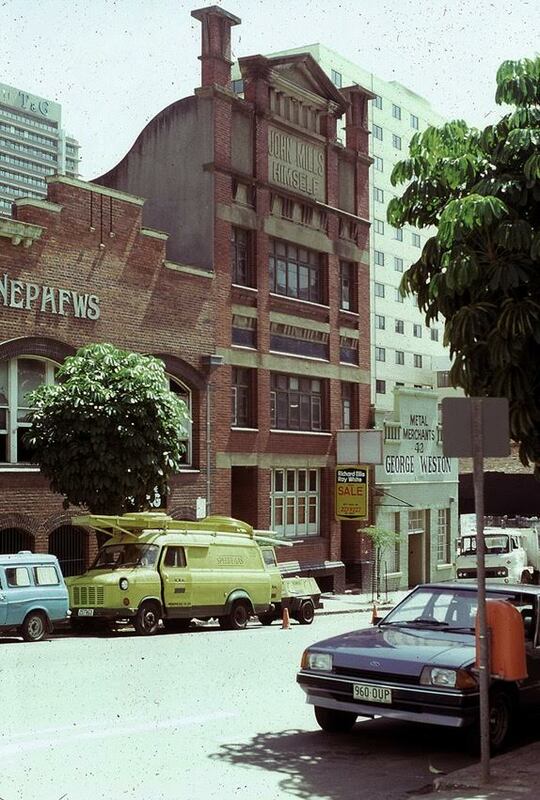 This archive is wonderful for reminding us of what a different environment Brisbane was back in the 80’s and also of the many artists who were putting themselves and work on exhibition. I was on the outskirts of the main collectives and at times it felt like Lyndall Milani and we made up our own group of artists who wanted to do semi architectural installations.